Could “Copenhagen Wheel” reinvent the urban commute? Notebook Slimz – A new twist on notebook design. The paper is fountain pen friendly according to the creator of this new product line. 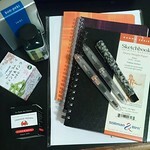 10% discount with code INKOPHILE10. Only 250 available, so order soon. 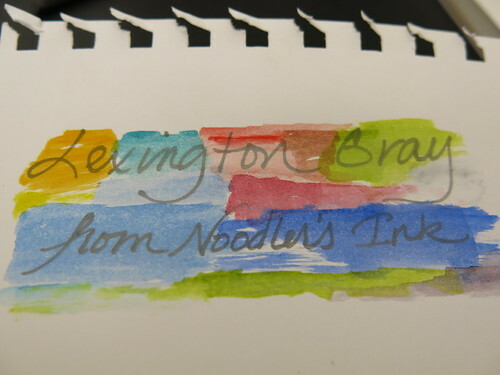 Can Ink And Watercolors Cohabit In A Doodle Journal? Did my recent post about doodling with pens and watercolors pique your interest? They don’t always play nice with each other, but the right paper can tame some of that antipathy and even let them work well together. Pencils are easy and can doodle on any paper. 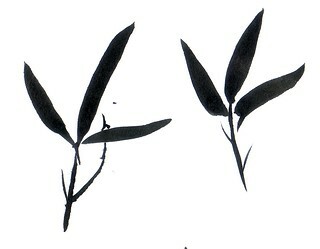 Paint over pencil lines with watercolor, as I did in the little flower painting above, and the markings remain intact. For a pencil/watercolor duo, any watercolor journal should do. Fountain pens work best on smooth paper, but watercolor paper is usually textured. Mixed media paper is smoother and can be a good compromise. Filling pages with a combination of ink doodles and watercolor dabs can be very satisfying and casual doodling should make use of the tools at hand. But if your inks lack the wherewithal to stand up to water, it’s easy to keep your doodles from co-mingling by leaving a quarter to a half inch gap between the ink and paint. For those inks that do stand up to water, there is a lot of fun to be had with putting ink and watercolor together. 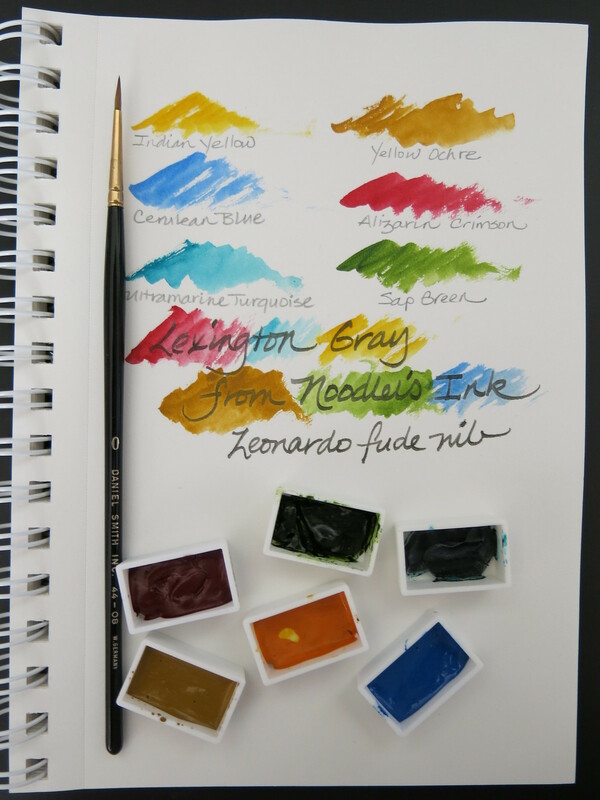 Most inks run away from even the smallest amount of water but Noodler’s Lexington Gray stands up well. 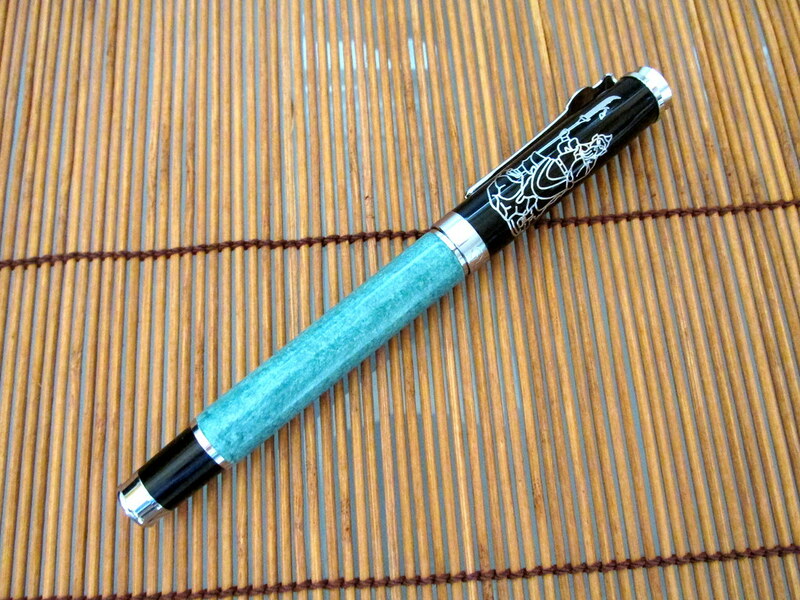 The words in the sample were written with a Leonardo fude (Asian calligraphy) nib. Then Daniel Smith watercolor was washed over to test the ink’s permanence and visibility through various colors. All turned out to the good. However, the Chinese manufactured Barnes & Noble Sketchbook paper, while smooth and a good size for a small desk, is not well suited to water-based media. It’s a sketchbook that takes pencil best. That has its place, but I want to have no such limits when the muse strikes. 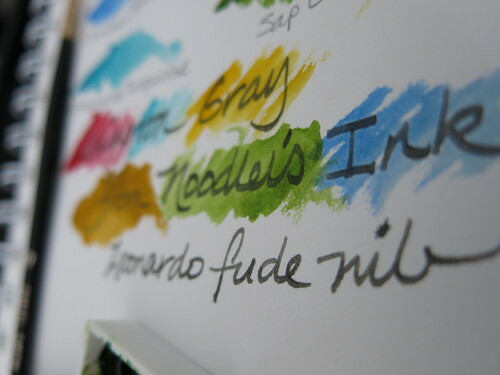 There are a number of paper products that meet the needs of fountain pens and inks, but fewer are suited to heavier water media like watercolor or chunky markers. 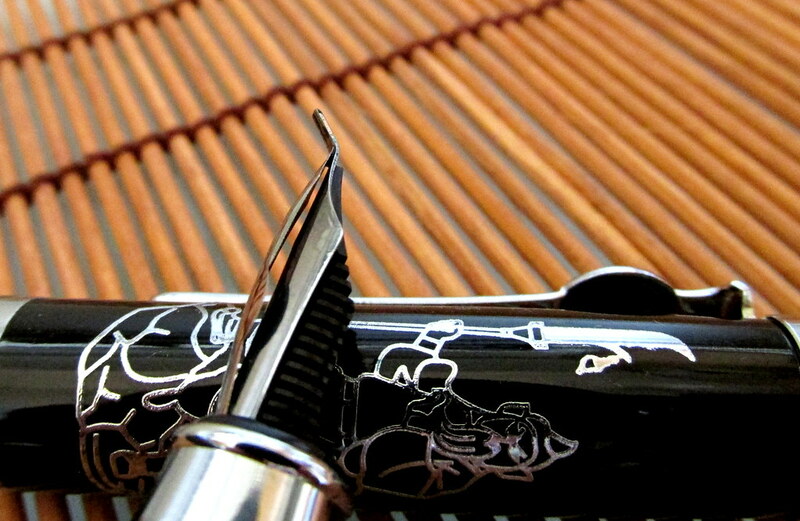 Many of those papers are too rough for fountain pens, especially those with narrow nibs. The paper that meets all my requirements would be smooth enough for pen use and thick enough to contain the flow of watercolor paint or anything that happens in between. My Pentel Pocket Brush Pen dances well with the Stillman & Birn Epsilon Series Sketchbook 150 gsm paper but the Zeta at 270 gsm can handle more water. When watercolor is my focus, the S&B Beta 270 gsm has a rough surface that adds texture to a painting, but away from my desk, the Zeta would be my choice for versatility. It’s such a heavy paper that both sides can be used and both sides are smooth so that’s another advantage. Aquabee paper is 150 gsm and not as heavy as the Zeta Series, but it should be good with most media. One side of the paper is lightly textured while the back is quite smooth so consider that when matching it to your tools of choice. Also, it is a more absorbent paper and will soak up your fountain pen ink making a wet writer seem dry. That isn’t bad – it’s just different. Canson XL Mix Media is another absorbent paper but it feels thinner than the others even though it is 160 gsm. That brings down the price but at a cost. Again, the front of the paper is rougher than the back. 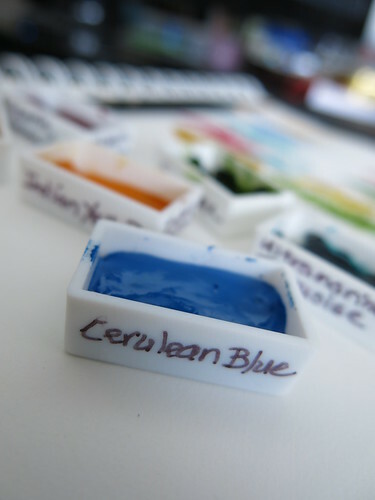 I’ve used Canson spiral bound books for years to test watercolors, long before I heard of S&B or Aquabee. At 160 gsm, it isn’t heavy enough for paintings, but it’ll do for color swatches and doodles. Strathmore Sketch is a 89 gsm, budget paper, but it doodles well when small amounts of color are used. More than five years of Inkophile ink tests have been done in these notebooks so there is that recommendation. Show-through happens so I only use one side for tests, but the paper takes swabbed ink well and that is what matters. It buckled somewhat with watercolor and a tiny bit of moisture affected the page beneath. No off-putting damage done, but a blotter sheet between the pages would have avoided that entirely. 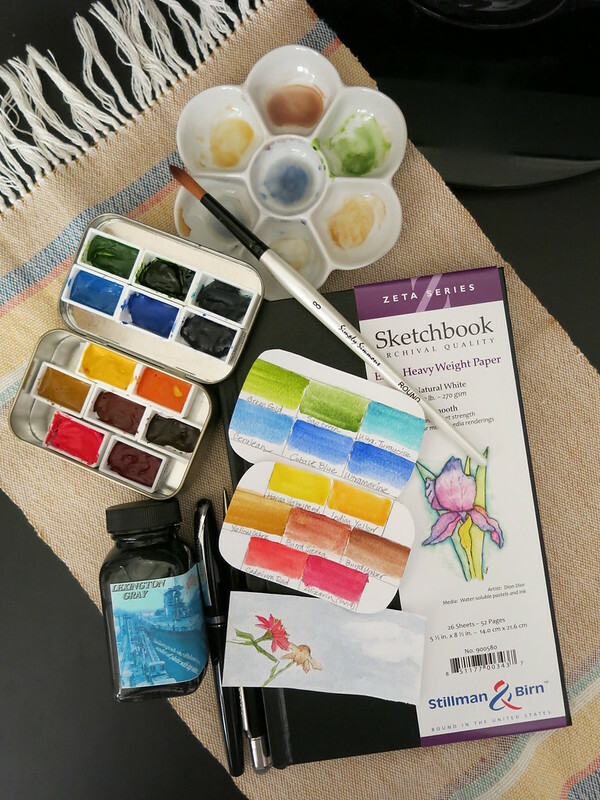 For the watercolor test, I used a Daniel Smith Kolinsky brush size 0 with Daniel Smith watercolors just as for the B&N notebook. Lexington Gray performed well again so it has found a permanent mate in the fude nib. Online retailer Daniel Smith carries everything you need including the plastic pans I filled with tube paint. If you want to keep things simple, there are a number of brands of pre-filled pans and kits that will get you started. For use in a journal, student grade will do. 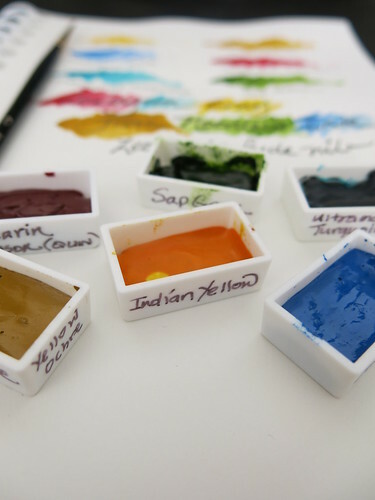 The Cotman series from Winsor & Newton is the most well known and fine for the purpose. If you are more serious about painting, buy artist grade. You never know when a masterpiece will emerge. There are empty kits designed to store paint, but an Altoids tin will suffice and holds seven pans in a single layer. Poster tack will hold them in place or double-sided tape can work in a pinch. If seven pans aren’t enough, you can attach more to the lid. Or you can line the lid with Yupo waterproof paper and turn it into a mixing area. At my desk, a 3″ to 4″ white china plates serve that purpose. My favorite one is shaped like a teapot and was originally intended to hold a used tea bag. Others were sold as dishes for dipping sauces. For $2 or less, these are handy containers for mixing additional colors, though most of the time, I just dip and doodle. Now about ink. Waterproof, bulletproof, water-resistant, and so forth sound great, but some inks so called are not easy on fountain pen nibs and feeds. If you go that route, use your pens frequently and clean them regularly. The former will keep ink flowing well and the latter will remove any debris that might result in a clogged pen. 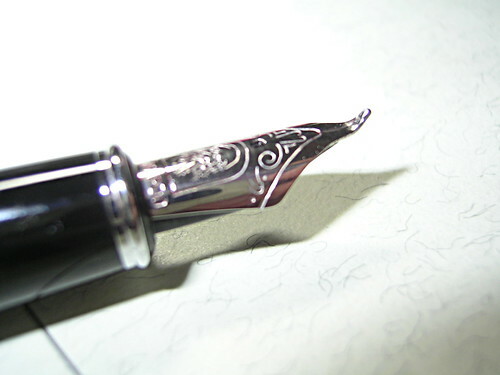 If you use a pen until no ink will flow, clean it in short order or refill with the same ink. The longer you wait, the more likely the pen will have problems. No ink brand bashing on Inkophile and I use whatever is on hand or submitted for review. With proper care, any ink can be worth using. If you use fine or extra-fine nibs, Stillman & Birn and Aquabee are good matches. Strathmore Sketch fits a tight budget or works for anyone who goes through tons of paper. I’ve been known to rip out a few pages, doodle around the edges, and use it for stationery. Paper like that will never go to waste. There are other suitable papers and your suggestions are welcome in the comments. Regardless of how you use it, the right paper counts and without a doubt your doodles are worth it! Update: There are some diminutive palettes available on eBay this week.